This is a proposed site for dugwell #PW143RSLP1 located in the village Rosullapur para in Chakdah block of Nadia district. Debdas Das donated the site for the community. Visited this borewell that was installed in 2010 because it has not been functioning for few months now. 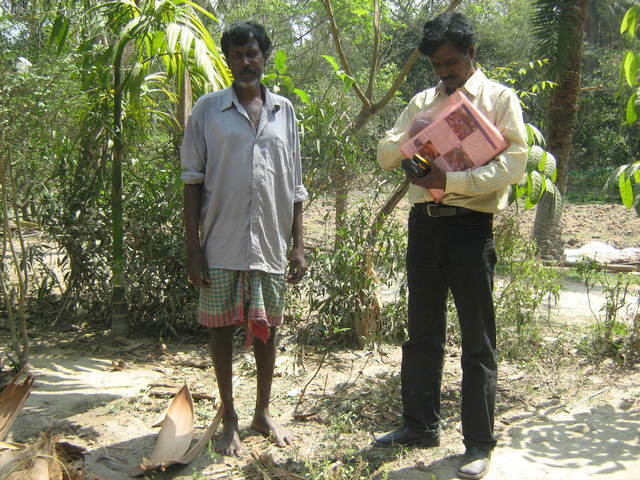 The hand pump is detached by the owner, debu das, due to dispute with the neighbors because he had requested the water users to fill water in buckets or pots instead of plastic bottles that spills more water. The new neighbor who constructed a one storey building opposite to their house is no longer allowing water to be drained over their property. After spending about 30 minutes in hearing stories of major incidents that occurred (including his son being almost beaten up) that forced him and his family to detach the hand pump. After talking to the neighbors and Debu Das and boosting his spirit once again saying that he gave the land for the community because he has a good heart and to rethink in doing the same. 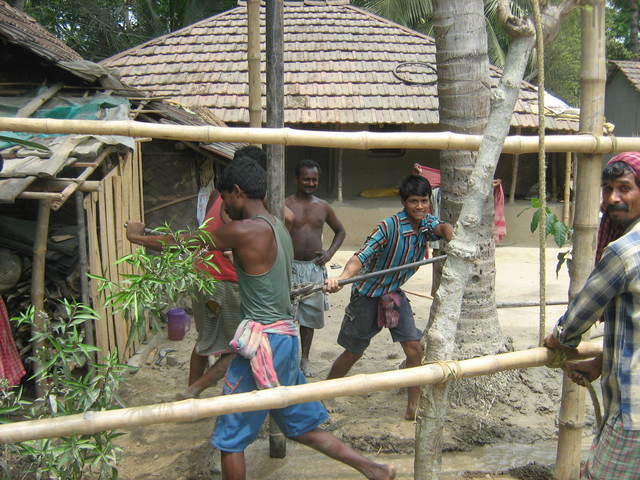 He agreed to re-attach the handpump and the neighbors will make the drain so that water passes to the pond that is behind the constructed house. Voila! problem solved. 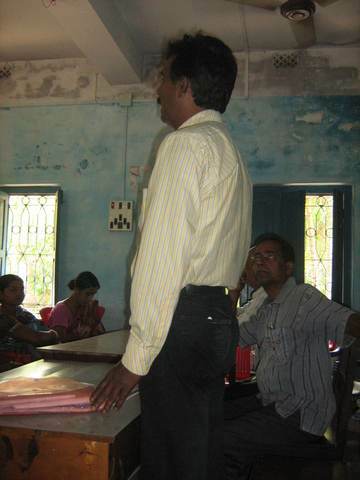 Shikha, the field worker of AWS, will follow up over phone next week. here water is good 20 family uses this well water. Thank You According to June's monthly status report there are 94 consumers. Research and Development is part of the project. This is a borewell with a 30 foot pipe of diameter of 10 inches and thickness 8 inches. No concrete rings are used in this model. This has been modified to observe the availability of water throughout the year. 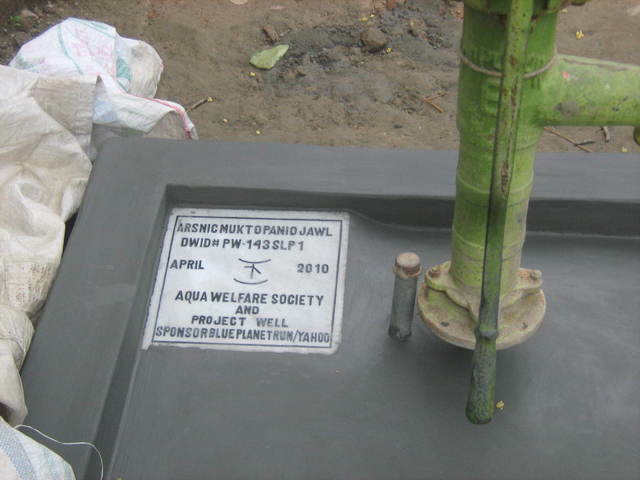 Though these borewells are arsenic safe, chlorination will continue. 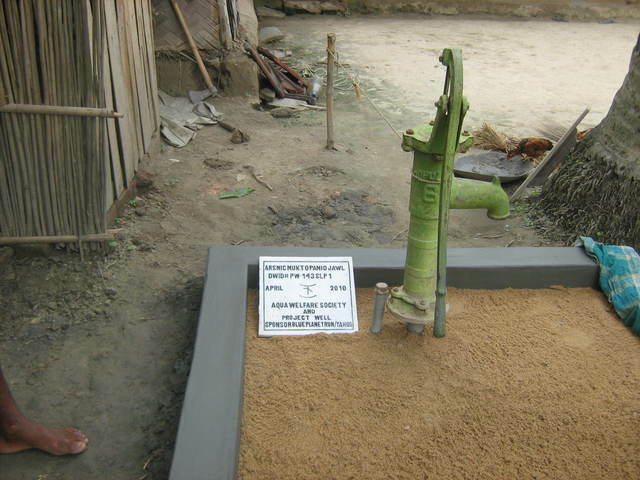 See the picture showing the tube attached to the borewell that is used to pour the theoline solution. According to the register record of July 2011 the total consumers=90; Families=18; Male=43, Female=47, children <5 = 4 and students =39. Now 9 families are using this source. Register is yet to be created.